When you live in Colorado, it’s your duty to spend at least a few of your days drinking, and a few of your nights camping... that is, unless you live somewhere east of Denver (why would you?). Then you get a pass. 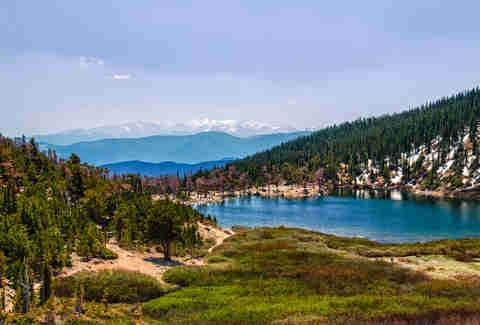 Luckily, this state offers up some of the best campsites in the country, but instead of just heading to the top-Googled site (here’s looking at you, Rocky Mountain National Park), we suggest you hit one of these eight underrated sites, all easily within driving distance of Denver. If dispersed camping seems a little too wild for you, try your hand at camping off Jones Pass Road. While still technically a dispersed camping site, Jones Pass Road is far more accessible by car. 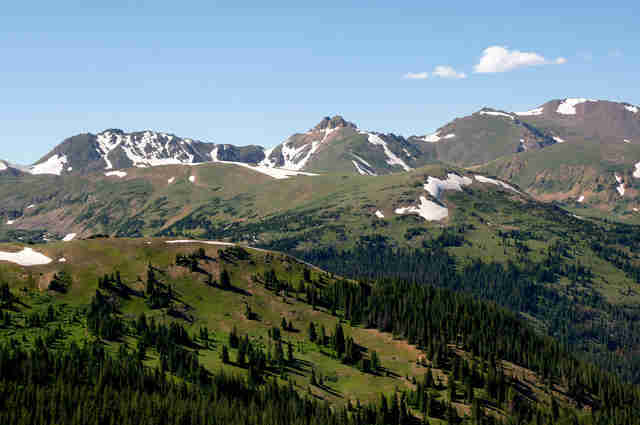 Located towards Henderson mine, which is on the way to Winter Park, Jones Pass Road has many sites off a small parking lot that are lined with Aspen trees and outlets for gorgeous mountain vistas and picturesque views of St. Mary’s Glacier. 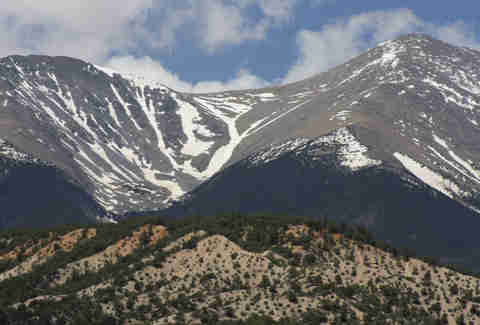 If you did bring the 4x4, continue down the road, which leads towards Vasquez Peak and even more isolation. The short drive up to Empire will gain you access to the Empire Loop, a lightly used trail that ends at the serene Bill Moore Lake, which is prime disperse-camping real estate. The area is also a haven for those who like to tear up dirt via 4x4, ATV, or mountain bike. The trail is rated “very difficult” and requires technical skill that goes beyond YouTubing “how to 4x4 like a boss.” For those who prefer to explore on foot, the area's also home to plenty of trails to occupy a weekend that vary from easy to difficult once you actually get up to Bill Moore Lake. Sometimes, the best camping isn’t done at a campsite at all. 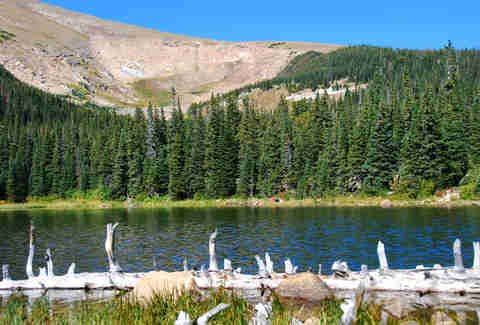 Dispersed camping is any camping done inside a National Forest outside a designated campground and is often the best way to fully experience the Colorado wilderness. Some of the more documented sites are up around Jefferson and include one location known as Jordan’s site. Taking county and forest roads, Jordan’s site is only accessible by using 4x4 vehicles and trailers limited to 15ft due to tight turnarounds. 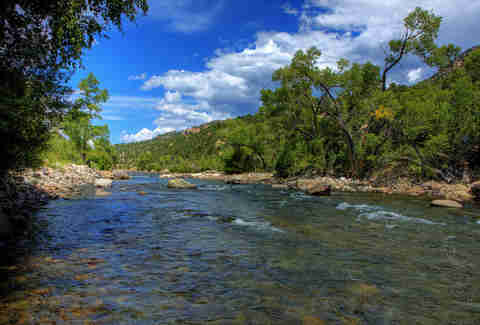 Once settled, Jordan’s site offers up great hiking and some of the best wildlife viewing in the area. Like bears! Distance from Denver: 1 hour, 32 minutes; 56.7 miles. Beartracks Lake Trail is another site offering up the kind of beauty that follows forest fires. Two of them struck this land -- the Resthouse Meadow Fire burned over 1,000 acres in the late 1960s, and was followed by the more recent Beartracks Fire in 1998. Getting to the trailheads requires high-clearance vehicles, so your Dodge Stratus is out, as wash-outs and infrequent trail maintenance leave the roads in poor conditions. 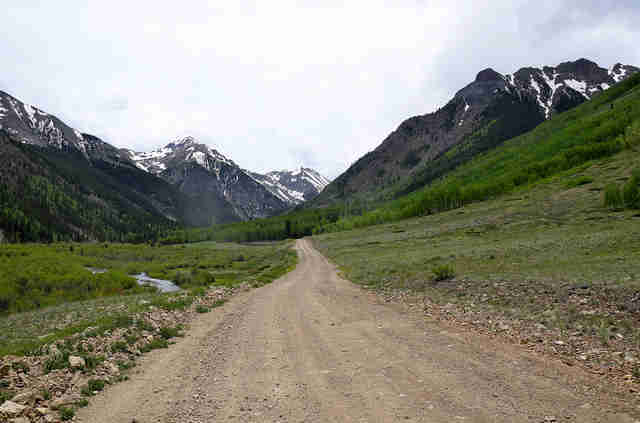 But as the saying goes, “fortune favors the bold,” and once you brave the bumpy road, you’ll experience some of the finest off-trail camping in Colorado. If you want to stay kinda close to civilization, but don’t want to “rough it” in your backyard, head up to the Rainbow Lakes Campground just west of Boulder, where you can experience camping but also be comforted by a 7-11 less than an hour away. The campground’s underrated-ness comes from its proximity to Indian Peaks Wilderness, which is home to some of the best backcountry hiking in the US. Once you’ve done a trek like the Rainbow Lake Trail, a moderate, 1.9-mile hike that offers up postcard views from the nine chain lakes that occupy the trail, you’ll be able to hang the boots high and kick it by a fire rather than make the trip back to Mile High. Pro tip: campsites 15-18 offer up a more primitive camping experience and will be less populated by the kind of “campers” who pull up in a RV. You yearn for the wilderness, but you haven’t owned a tent since the little pop-up you got for your eighth birthday. Don’t worry, the rustic (and unquestionably cool) Bassam Guardstation cabin outside Buena Vista is for you. The guardstation, formerly occupied by a forest guard that documented forest conditions as early as 1911, boasts a full-sized bed, chairs, a table, propane tanks, a hand pump for water, and a very Jack Kerouac aesthetic. The place goes for $50 a night, allows stays up to two weeks, and even permits extra tents on the premises to accommodate your beatnik friends. 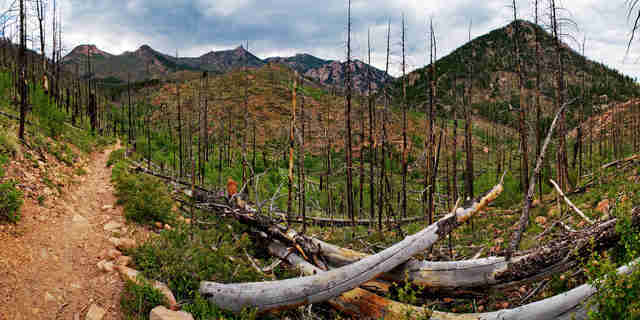 Goose Creek Campground is a diamond in the rough, meaning it’s the only surviving campsite from the Hayman fire that ravaged the land two hours southwest of Denver back in 2002. It offers a sort of solemn experience, showcasing half-burned trees and, in some areas, a post-apocalyptic feel Mad Max might dig. But its not all dull and dreary, as wildflowers litter the surrounding valleys and meadows during the spring and summer seasons, and offer a stunningly stark contrast to the burn-scarred land. The main site is first-come, first-served, so it’s best to arrive mid-week to guarantee a spot for the whole weekend. Those who trek further down the Goose Creek Trail will almost always find open sites, especially by Refrigerator Gulch, which unfortunately does not come stocked with beer. The Angel of Shavano Campground sits in the shadow of Mount Shavano and is one of the best-kept secrets the area, which is rich in Ute history. According to legend, the angel that forms in the snow melt on the southeast couloir of Mount Shavano, where the site gets its name, is the spirit of a little girl the gods turned into ice. If you’re lucky, you might also make out the face of The Grinch, which has no connection to Ute history. 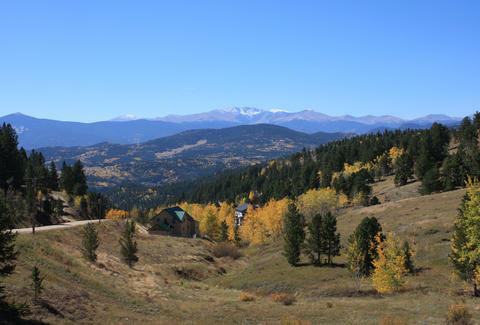 The site’s hike-in nature and low number of campsites make for few visitors, but even if the other sites are occupied, each plot is secluded, and boasts so many Aspens and spruce trees you’ll still feel like you’re all alone. Except for the girl in the ice, obviously. Connor Green is a writer based in Denver.